Dermalogica Daily Superfoliant Review (2018): Does It Deliver Results? What Is Dermalogica Daily Superfoliant? This product is manufactured and distributed by Dermalogica, a skincare company established in 1986. Originally, this product was intended for the use of skincare therapists that its center, the International Dermal Institute, trains approximately 75,000 students every year. Today, the brand boasts of a robust lineup of products for everyone to enjoy, ranging from cleansers, moisturizers, exfoliants, and everything else beyond and in between. However, most of its merchandise are known for being overpriced from this brand. This product has been formulated with the damaging and aging effect of environmental stressors under primary consideration. It addresses these directly with Activated Binchotan Charcoal. Simultaneously, your skin is treated to a significant moisture and nutrient boost to promote its overall health and youthful appearance. Dermalogica Daily Superfoliant, US $59 for 2.0 oz., is a powder exfoliant that purifies and exfoliates your skin everyday to resurface beautiful, blemish-free skin every single day as well. Dermalogica Daily Superfoliant – Does It Really Work? Rids your skin of impurities and draws out grime from your pores as well. Delivers deep cleansing to protect your skin from irreversible damage and aging caused by environmental stressors everyday. Smoothens and brightens your skin with regular use. What Are The Ingredients In Dermalogica Daily Superfoliant? Activated Binchotan Charcoal: Adsorbs impurities deposited in your pores and stuck on the surface of your skin, purifying your skin and helping your skin fight early signs of skin aging. Niacinamide: Has antioxidant properties, this ingredient also helps enhance nutrient and fluid circulation, promotes enhanced moisture absorption, and aids in re-energizing your skin cells to make repair, rejuvenation and renewal happen at much faster rates and in a more efficient manner. However its effectiveness is not proven. Red Algae: Enhances skin moisture and nutrient content, it also provides antioxidant protection that defends your skin from free radicals. Tara Fruit Extract: Provides added antioxidant protection to defend your skin from environmental stressors. Oryza Sativa Starch: Has natural anti-inflammatory properties that helps calm and soothe skin irritations to promote a better and more even skin tone. 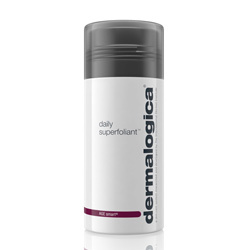 Dermalogica Daily Superfoliant must only be used on freshly cleansed skin. Rub about half a teaspoon of the product between your palms then, massage in and leave on for 1 minute before rinsing it off with lukewarm water. Do this once everyday as recommended or, a few times in a week if your skin does not tolerate the product well. This product does not contain endocrine-disrupting parabens, artificial colors and fragrances. Dermalogica Daily Superfoliant reviews have generally indicated that this product will not leave your skin greasy nor tacky. The formula is infused with several skin brighteners to lighten dark marks and enhance your overall skin tone however its not proven clinically. This product is not recommended for use on skin that received medical-grade, in-clinic procedures or treatments. This product is formulated with several botanical ingredients that can potentially irritate your skin. Users have complained about this product’s poor packaging which wastes a lot of the product with every use. Claims to be proven but it was not tested by an independent laboratory. Does Dermalogica Daily Superfoliant Have Any Side-Effects? Skin irritations and allergic reactions due to several ingredients, particularly fragrance ingredients and botanical extracts, depending on your history of allergies and reactivity with these ingredients. Increased risk for permanent skin damage due to silicones. Dermalogica Daily Superfoliant may be the purifying step you need everyday to revitalize your skin. Frankly, it still isn’t clear to us why anybody might need this extra step when you have a good cleanser to do what this product proposes to do for your skin. Finding the right cleanser, therefore, will save you time, money and effort from having to add on this product to your routine. If you needed an extra boost, you may have to seriously consider getting a daily AHA/BHA treatment instead.